SearchReSearch: Search Challenge (July 18, 2012): How much did Jefferson think about wine? Search Challenge (July 18, 2012): How much did Jefferson think about wine? Thomas Jefferson, the third president of the United States, was famous for many things—writing the Declaration of Independence, being a scientist, founding the University of Virginia, designing Monticello, traveling widely in the 18th century, inventing new agricultural practices—the list goes on and impressively on. He was our first nerd president, a polymath of the first order. He was also reknown for his wine collection, his taste and perception being on par with the best in the world. This is a quotation from a letter to a man he called "Doctor." 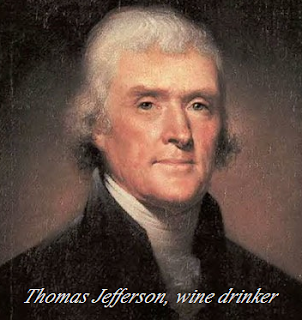 So now I'm curious--how much DID Thomas Jefferson think about wine? I can't measure how much he thought about it, but we CAN search out how often he wrote about it to friends. 1. (Easy) Who was Jefferson writing to when he wrote this famous line about “I have lived temperately… I double the Doctor’s recommendation…”? What was the correspondent’s name? 2. (Medium) Amazingly enough, more than 200 years later, the correspondent’s house still stands. What color was that person’s house in 2009? 3. (Hard) How many times did Jefferson refer to wine in ALL of his writings? As usual, please tell us not just the answer, but also HOW you found the answer, and how long it took you to find it! For the color of the house I just did [Dr. Vine Utley house], the 1st link was to a page on Wikimapia with the coordinates ([41°19'53"N 72°13'32"W] directly in the search box) and a photograph of the house. Went to Google Maps with these coordinates and checked the color of the house. For the writings I just did [jefferson writings database], 1st link was to Jefferson writings on virginia.edu then from there to http://rotunda.upress.virginia.edu where I could search the database for writings by Jefferson with "wine" in the text. The result page first gave 217 occurrences but after perusing the 3 or 4 following page the result turned to 236 but going to the last page gave 218 (!). Checking with the "Main series" and "Retirement series" gave 196 + 22. So I guess the answer _may be_ 218. 1. Searched for: thomas jefferson I have lived temperately wine, got waylaid at the Monticello Encyclopedia, but couldn't find the correspondent's name. Then found The Healthful Habits of Thomas Jefferson and the doctor's name is: Vine Utley. 2. Searched for Vine Utley house. Found it located in Niantic, CT with coordinates of 41°19'53"N 72°13'32"W. Looked up the coordinates on google Maps, zoomed in on the house and the paint is white in 2009 (when the pic was taken). 3. I couldn't figure out how to find all of TJ's references to wine -- I have to get back to work! 1. Who was Jefferson writing to? What was the correspondent’s name? "Dr Vine Utley" A search of the actual phrase. 2. The correspondent’s house still stands. What color was that person’s house in 2009? "Brick & White" Image search. I found that using the date range didn't matter. The house stays the same as far as I can tell... historically correct. 3. How many times did Jefferson refer to wine in ALL of his writings? I'm not good enough with searching yet to figure this one out. I'll wait for an answer. It's too stressful without proper knowledge of all searching options. It took me about 15 minutes to find all answers due to a couple of dead ends. I googled the quote starting with “ I double…” and several results mentioned Keswick Hall. Next I googled “Keswick hall Jefferson” and the second post mentioned that Jefferson established a vineyard with Filippo Mazzei. Next I googled “letter Jefferson Mazzei” hoping that the quote was from a letter to Mazei. It was not but I found an index of “The Papers of Thomas Jefferson” at Princeton.edu. I could not find a searchable index of papers so I googled “index Thomas Jefferson letters” and went to Gutenberg.org where there were 4 volumes of Jefferson’s correspondence. I searched each volume for the quote and found it in Volume 4, in a letter written to Doctor Vine Utley in 1819. To find Utley’s house I googled “doctor vine Utley” and a wikimapia.org post showed the satellite imagery for his house that he lived in from 1768-1836. The house was on Roxbury Road and I searched the coordinates in Google Maps and Street Viewed the house. The image was from September 2009 the house was white. To find the number of times that Jefferson mentioned wine, I returned to the 4 volumes of correspondence on Project Gutenberg and searched for wine in each volume. The total number of times “wine” showed up was 110 times. 1. Jefferson was writing to Dr. Vine Utley, dated March 21, 1819. I found this by entering the search string: "I have lived temperately....I double the Doctor's recommendation of a glass jefferson correspondence", then navigated to the tenth result, www.gutenberg.org/files/16784/16784-h/16784-h.htm, and used ctrl+f "wine" to find the letter to Utley. 2. The house color appears to be a white/off-white/beige with green windowpanes and a gray roof, although it's hard to tell given the house is in the shade. To find this, I performed a Google search "Vine Utley house", and clicked on the first result from Wikimapia, here: wikimapia.org/1918078/Dr-Vine-Utley-House. This provides a latitude/longitude, which I plugged into Google Maps and clicked on street view. The tricky part about this was not assuming the default view was correct; you must spin around 180 degrees to view Utley's house. 3. Jefferson refers to wine 217 times in ALL of his writings. I arrived at this number by performing a Google search "Thomas Jefferson writings", then selecting the seventh result from the website of Monticello. www.monticello.org/site/research-and.../editions-jeffersons-writings. There they contend the Princeton edition of his writings, 42 volumes to date, is the most comprehensive collection, and is available digitally at: http://rotunda.upress.virginia.edu/founders/TSJN.html. From there it was a matter of searching the text for "wine", and setting the name 1 field as Jefferson and as an author. Ah, and it took me approximately 20 minutes, after double-checking answer number 3 against some other sources. 1. Search for "I have lived temperately". Link #3 is a vegetarian page on Monticello.org with a footnote referencing a letter to Dr. Vine Utley. 2. Search "temperately double jefferson utley". Link #3 is a Wikisource.org copy of the letter, verifying the footnote in step 1. 3. Search "vine utley house". Link #1 is a picture of the house in wikimapia,org. 4. Since I couldn't figure out how to get an address from wikimapia, I unzoomed the map until I could see some landmarks, and then located those landmarks in Google Maps (~155 Roxbury Rd, East Lyme, CT). 5. In Streetview, the house appears white. 1) Search on "writings of Thomas Jefferson". Link #4 is the text from all 19 volumes at constitution.org. 2) Load each volume, search the page for "wine", cycle through each result ensuring that it's a reference to wine and not a larger word that contains "wine." 3) Count 259 uses of the word "wine", also noting that Jefferson wrote "twine" four times, and "swine", "entwined" and "Brandywine River" one time each. Elapsed time: ~35 minutes, including starting over after the initial source for the writings gave a 404 error on Volume 9, and also realizing I had to go back and look at each "wine" word after inadvertently noticing "entwined" as one of the matches. Very though ones. I think I got 2 answers :(. Please let us know the answers! Oswaldo -- See my answer today for details. Your solution of going to constitution.org is as good as mine. Note that our numbers are slightly different, but VERY close. Nice job! 2. Answer: White; Method: searched for [Dr. Vine Utley] and found an article on his house with coordinates. Entered the coordinates into Maps and did a streetview on the address and saw the images were from 2009. 3. Searched [Thomas Jefferson writings search] and came up with the Monticello.org site with specific tips on searching but didn't want to go further. I have answers anywhere from 27 to 400+. Stumped. This one was a little harder. Not sure if I'm right, but I'll throw my answer out there. This one took about 40 minutes. [Thomas Jefferson "I have lived temperately"]\Books\click on "full view" on second result\title of page is "TO DOCTOR VINE UTLEY"
[ “I have lived temperately....I double the Doctor's recommendation of a glass and a half of wine each day and even treble it with a friend.” ] produced too many quotation pages to sift through. Search 2 [ "Doctor Vine Utley" ] was not helpful. Switch to [ "Dr. Vine Utley" ] to find a link to wikimapia location. Coordinates didn't work to search in Google Maps. Back to the zoom out to find nearby Bride Lake. Zoom out further see it is in Connecticut. In Google Maps search [ Bride Lake Connecticut ] follow Roxbury Road to the 155 Roxbury Road, East Lyme, Connecticut. Imagery date is 2012. Drag PEGMAN to Roxbury Rd. and see the house is WHITE and the imagery date is 2009. Tried many different searches. Really stuck with this one. I found two books on Thomas Jefferson and Wine. Tried seeing if there was anything in those books about the number of times Jefferson mentions wine in his writings and came up short. Tried searching for Jefferson's writings and papers in Google Books and the results were hard to organize. I went to Project Gutenberg and searched each publication they had where Jefferson was the Author. I did a find on page for each publication and added them up. Index list Wine with 30 hits subentries. When I got the results for [wine] in Ngram, the graph was broken into time periods. Each time period is a link to Google Books published during that period of time that mention wine. In the search box I added the inauthor: operator to each time period and added together. The Ngram search for [ wine ] for the time period 1746-1830 displayed results broken into time periods. Each time period was a link to a Book search for wine mentions during that sub time period. I added [inauthor:Thomas Jefferson ] to search and got a results for wine mentions. I did that for each time period and added them up. So does Ngram takeout duplicates or different versions of the same work and regular Google Books doesn't? 2. Typed "Dr Vine Utley+house" in google web and got a wikimapia page that showed the co-ordinates and the house (partly). Then I used the Haversine formula to convert the lat longs and typed the decimal format to google maps and got to the street view to the house and found a white colored house. 3. The answer to the last question is most probably wrong ("I got 52, searching for ' intext:"wine" inauthor:"thomas jefferson" ' and putting the dates till 1826 in Google Books. (1) Jefferson was writing to Dr. Vine Utley, about Dr. Benjamin Rush (the "Doctor" mentioned in the quotation). (2) I thought this was referring to the Utley home, but I think this question makes more sense for the Rush house. It was a dirty white (almost peachy on the second story) before it underwent a massive restoration in January 2010. Process: Searched " 'thomas jefferson' letter doctor treble" and came up with http://www.let.rug.nl/usa/P/tj3/writings/brf/jefl254.htm, which provided both the recipient of the correspondence (Utley) as well as the "Doctor" mentioned (Rush). Searched "dr 'vine utley' home" and came up with the same Wikimapia link that some of the other commenters found. I plugged the coordinates into Google Maps and found 154 Roxbury Rd, Niantic, CT 06357. The Streetview picture was dated 2009 so I thought I was done, but as due diligence I searched the address and saw in Zillow that the house on the site was built in 1962 (http://www.zillow.com/homedetails/154-Roxbury-Rd-Niantic-CT-06357/58960329_zpid/). At that point I redirected my search to Benjamin Rush's house, assuming that when the question refers to "correspondent" it actually means the correspondent that Jefferson was mentioning to Utley. I searched "Benjamin Rush" house and the first link was an article dated 2009 about restoration of the Greenwood Cemetery, where the Rush house now stands (http://frankfordgazette.com/2009/08/17/knights-of-pythias-greenwood-cemeterybenjamin-rush-house/). I followed up with the cemetery website, and both there and in the news article the photos of the pre-restoration house shows a dirty white first floor and an almost pink/peach upper floor, which could also just be stain and wear (http://www.kpgreenwoodcemetery.org/news/article14.aspx). The date of the restoration clicks with the question about the color of the house in 2009. Finally, I searched "thomas jefferson complete works" and came up with a 1904 compilation of all of his writings and correspondences (http://oll.libertyfund.org/?option=com_staticxt&staticfile=show.php%3Ftitle=1734). "Wine" and "wines" appear 74 times (thanks to ctrl+f). I went through each occurrence to make sure it's not "entwine" or "Brandywine" or some such. This search obviously does not cover any mention Jefferson makes of specific varieties ... I dunno, like "sauterne." Took about 15 min total. I didn't think about trying to count wine varietals (sauterne, etc.). That would be an interesting FUTURE challenge! 1 - the correspondent name is Benjamin Rush, writing in 08/17/1811. 2 - the color is Brown and White. 3 - the number is 41. And HOW did you figure it was 41? Greetings! Great challenge for this first-time visitor. Part 1 I solved by searching for [jefferson wine doctor letter], and Dr Vine Utley's name appeared in the third result (after two hits about this challenge). This took a minute. Part 2 involved finding the doctor's house location: search [dr vine utley house] and the second result (wikimapia) gives the name of the street and town, with an aerial photo. A search on Google Maps for Bride Lake nearby enabled the comparison of photos, so I could zoom in and drop the street view guy down in front of the house location. The house was white in 2009 when the street was filmed, per the date at the bottom of the image. This took about 10 minutes, with a break in the middle for dinner. Part 3 started with a search for [concordance jefferson letters] which gave me hope from the University of VA, but I reached the limit of what my wee netbook could handle. Closed windows, gave up for a while, then just selected the text of the question, which led me to the book "Thomas Jefferson on Wine". I skimmed the introduction, which states that there were "literally hundreds of letters just about wine" (p. xi), so that's my answer, hundreds. Search time about 15 min. on part 3, not counting the giving up in the middle. Answer (7/11/12): Where can I get that book? Answer: Who is the mystery man?